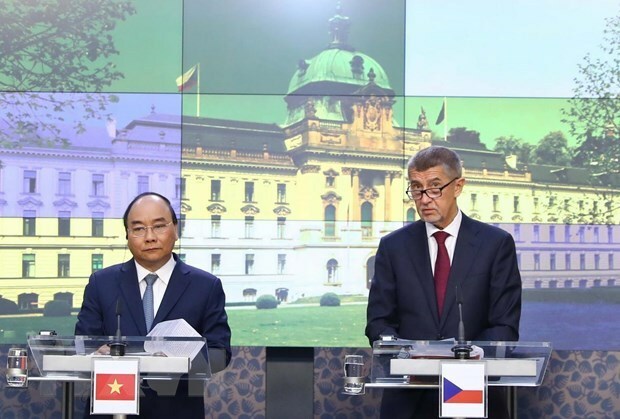 Prague (VNA) – Prime Minister Nguyen Xuan Phuc and his Czech counterpart Andrej Babis have agreed to collaborate to speed up the launching of a direct air route linking Hanoi and Prague. Meeting with the media after their talks in Prague on April 17, the two PMs said that they sought a number of measures to boost bilateral ties in many areas, especially education-training, agriculture, science-technology, the environment, and culture-tourism. PM Babis expressed his delight at meeting the Vietnamese PM once again after their talks in February 2008. He stressed that the Czech Republic and Vietnam have shared a close partnership over nearly seven decades with regular delegation exchanges. The Vietnamese community in the Czech Republic has also made positive contributions to the socio-economic development in the host country, he noted. Vietnam is the third largest partner of the Czech Republic among ASEAN member countries, he said, adding that the two sides have seen sound development in collaboration in trade, investment, and many other areas. The Czech Republic’s exports to Vietnam have grown 30 percent in recent years, while Czech businesses hope to increase the exporting of goods to Vietnam, said the PM. PM Babis revealed that at the talks the two PMs discussed various promising cooperation areas, such as mining, tourism, aviation, and culture-education, as well as issues regarding visas. The Czech Republic supports the EU’s signing of the free trade agreement with Vietnam (EVFTA) he stated. For his part, PM Phuc thanked the Czech PM and people for their warm welcome. He affirmed that his talks with his Czech counterpart were productive, during which both sides agreed on a number of solutions to improve the efficiency of bilateral cooperation in the future. He clarified that Vietnam highly values the Czech Republic’s support to the early signing and ratification of the EVFTA and the EU-Vietnam Investment Protection Agreement (EVIPA). The deals are of strategic significance for economic-trade cooperation between the EU and Vietnam, helping businesses from the EU and the Czech Republic access the over 90-million-strong market and creating favourable conditions for collaboration in services, finance, telecommunications, and public procurement. The EVFTA will help enhance the position and role of the EU in Asia, he said, pledging that Vietnam will be a gateway for Czech enterprises to approach the ASEAN and East Asia markets.